Karl has almost 30 years of experience in identification of birds, amphibians, reptiles, mammals, damselflies & dragonflies, and butterflies across Ontario. Karl specializes in field ornithology and has applied these birding skills throughout Ontario as well as in Saskatchewan and Hawaii. 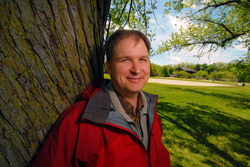 His expertise encompasses seasonal wildlife surveys, wildlife habitat assessments, wildlife monitoring, ecological research, peer review input and OMB witness testimony, and the development of regional significant wildlife species lists. He also has an excellent knowledge of the various protocols used in wildlife inventory and monitoring programs.